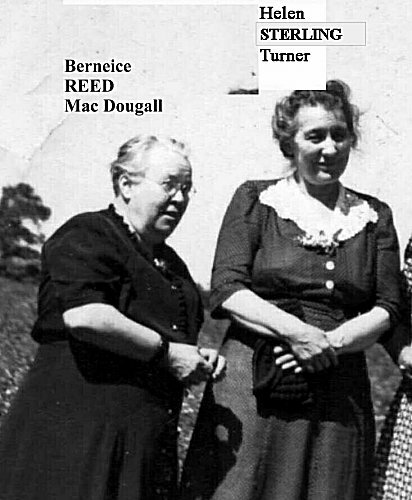 Photo at left of Berneice REED MacDougall and Helen STERLING Turner - neighbors on Ridge Road. 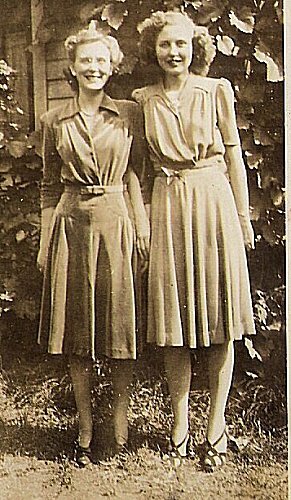 Together Helen and Berneice have given us a good survey of life on Ridge Road in the time before and during World War Two. Mr. and Mrs. Royal Douglass of East Franklin Street received the following War Department message on Tuesday evening: "The Secretary of War asks that I assure you of his deep sympathy in the loss of your son, Second Lieutenant Arthur A. Douglass. The report received states that he was accidentally killed 2 July in Hollandia, Dutch New Guinea." Lt. Douglass was born November 15, 1921 and was a native of Horseheads where he attended both the grade and high school and was a graduate of Horseheads High in 1939. He enlisted June 2, 1942 and his early training was first at San Antoni, Texas, then to Parks Air College, East St. Louis, Mo., Garden City, Kansas, then to Eagle Pass, Texas, where he graduated and received his pilot wings and commission. He was stationed for a time at Columbia, S. C., before going overseas and most of his service has been in Australia and New Guinea. Artman's last visit home with his parents was early last December just before leaving to take up service overseas. His last assignment was as a pilot of a B-25 Mitchell bomber and he had completed several missions. For a considerable time he had been stationed within five miles of Pfc. Richard Saunders of Horseheads and they had met frequently. Lt. Douglass was an active member of the Horseheads Baptist Church and of Horseheads Grange. He is survived by his parents, Mr. and Mrs. Royal Douglass, and these brothers, Cpl. James D., Royal Jr., Paul and Hugh C.
We all went to church. Small attendance. Rested, wrote and read in p.m. Vern and Elizabeth Wise and boys and Hattie Sterling called - Hattie has a new place to stay. Had new potatoes and peas for supper. Everything very quiet for the 4th. I celebrated by doing a big ironing. Men drew hay. Walter's 10th birthday. Marian, her boys, Helen and her boys and I went out to Hector to get cherries. Went down to Smith's nearer the lake - got both sweet and sour. Back to Watkins park and had picnic dinner. Boys went in the lake. Not a ripple on it and the water as clear as crystal and real warm. Did some shopping - tried to get Walter shoes for his birthday but the store was closed. Stopped in Odessa. Freddie had to be barbered. Got sugar, certo rubbers etc. to do cherries with. Did one canner of sweet cherries at night and made jam. Finished canning cherries and did a canner of peas. Sunday School Class meeting at Miss Kimmich's. Cleaned eggs all forenoon and dressed 8 hens in the p.m. got a late start for the meeting - had a swell evening - very, very hot. Dairymen's League Dinner served by Grange. Helen had charge of dining room - swell meal - baked ham, creamed potatoes, Harvard beets, scalloped corn, pickles, rolls, fruit cup, ice cream and cake (and lots of it). Gave report on Syracuse meeting (and nearly sweltered doing it). Samsons went to Cortland. Home all day - still hot and dry. Newspaper Clipping: Grant Shappee, a prominent resident of this locality, was found dead in the bedroom of his home Wednesday noon by Anson Saunders. Mr. Shappee is survived by two sons, Paul of Corning and Lawrence of Horseheads; a daughter, Mrs. Daniel Dalrymple of Lockport; and a sister, Mrs. Charles Dewitt of Portland, Oregon. Miss Emily Dalrymple, daughter of Mrs. Grace Dalrymple of the Watkins Road, and Lionel Wagner, son of Mr. and Mrs. August Wagner of the Middle Road were united in marriage Sunday at 2 p.m. at the home of the bride's aunt and uncle, Mr. and Mrs. Charles Dalrymple on the Sing Sing Road, by the Rev. C. Hildreth Wilcox. C.C.N.G.A. picnic at Harris Hill. Samsons did not go on account of polio epidemic. Charlie and I attended. Such a lovely place for it. Had a very good dinner and a nice time afterward. Helen took me to do the last two of my F.S.A. clients. One Benedict on lower Maple Ave. raises vegetables and has acres of all kinds selling sweet corn for .75 per doz summer squash at 7 cents per lb. Very nice appearing people. Went on to Wellsburg where Helen went to see about getting some lumber (they starting to repair the little house) then on to Lowman and looked up George Williams - the worst old crook I ever came in contact with - filthy old tumbled down house etc. Back to Elmira for dinner. Did some shopping. Got a congoleum rug for our room. Called at Benjamin's on way home - saw the new baby. Ollie having terrible time with severe headaches. Went to bed with gas bothering and woke up at 11:00 with some sort of seizure. Every symptom of angina. The circulation about all stopped in my arms. Suffered something awful. Dr. Jackson came up at 11:30 - he thinks my trouble was all caused by gas as my heart was in quite good shape - better than if I had had angina. Hope he is right. Got up and dressed quite weak but coming! Ollie called to see how I was and I answered. Her headaches no better - had been to Dr. Hitchcock but did no good. Are speeding right your way! My three dear little neighbors. Mr. and Mrs. Benjamin F. Turner Jr., above, were married Apr. 10, 1944, in the Carlisle Rd. Methodist Church, Londonderry, Northern Ireland. The Rev. H. Irvine officiated. The bride is the former Miss Muriel Beryl Reynolds, eldest daughter of Mr. and Mrs. W. G. Reynolds of Londonderry, Northern Ireland. 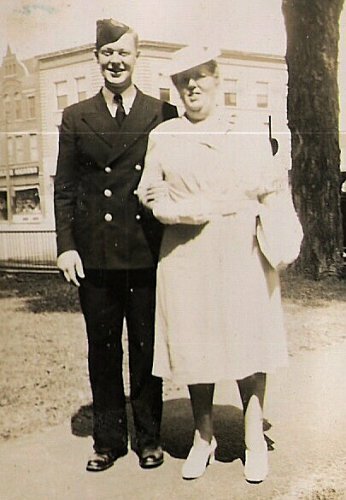 The bridegroom, motor machinist's mate 1/c, is the younger son of Mr. and Mrs. Benjamin F. Turner Sr. of Upper Oakwood Ave. he has been stationed in Northern Ireland since December, 1941. Ollie Benjamin taken to the hospital. Had one of her attacks and lost consciousness. Awfully worried for her. Helena and I attended a sale in Millport in afternoon - went to H-H for groceries in the morning. The sale was at Waterman's (at Edna Burch's home). Bought a few little odds and ends including a nice antique pitcher for $.60. Saw a lot of friends so enjoyed the "affair." Did my two week's washing - the first since I was sick - stood it very well so feel much encouraged. Mr. and Mrs. John Vondracek of the Veteran Hill Road on Monday received a telegram from the War Department at Washington, D.C., stating that their son, Pfc. John Vondracek, 22, had been killed in action in France on August 2. Pfc. Vondracek served as a cook with an infantry company and had been in service nearly two years. he had formerly attended Horseheads High School and before going into service was employed at the Dairymen's League plant. He is survived by his parents; by a sister, Rose; three brothers, William, Richard and James, all at home. Helen and I went to city to get the new truck license transferred etc. Had a hectic - the hottest day I ever did see down there. So glad to get back o the hill. Clara Bell and Ed up and spent the evening. The three past days established a high peak record for the same period over many years. Charlie has wheat on piece combined and started on oats. Both yielding very good. Ollie still in a coma - no hopes at all. Seems too awful to believe. Newspaper Clipping: Mrs. Ernest Benjamin, 53, of Ridge Rd., Town of Veteran. Saturday, Aug. 5, 1944, at 5 p.m. at a local hospital after a brief illness. She is survived by her husband; one son, Stanley at home; two grandchildren; and one nephew, Lt. Wayne Hollenback. She was a member of the Horseheads Methodist Church and of Veteran, Pomona, state and national Granges. The body is at the family home, where the funeral will be held Tuesday at 2:30 p.m. Rev. Earl Robertson. Vare Cemetery, Ridge Rd. Helen and I went to Elmira to finish up trucks transfer etc. Had a corsage made for Ollie. Stopped at Benjamin's when we went down - took pie and cake. Edna Turner presiding! Ernie a perfect wreck - so sorry for him. Ollie looked lovely - so peaceful and natural. Such a terrible hot day. Sent beans and salad to Benjamin's in morning. Charlie had to sit with assessors for grievance Day so could not go to the funeral. Helen, Harry and I went. House packed and many outside. Such lovely flowers and so many of them. Everybody just stricken! Mr. Robertson preached a wonderful sermon. Hot and humid. Everything drying up. Corn all rolled and cucumbers dying. Went down to Van Duzer's in the evening. Mrs. Van Duzer very miserable with back misery - presumably from her broken hip. Thursday evening: The well drillers finished the well at The Parsonage. 85 ft. only 10ft of casing and a fine big producer. The hottest day yet. Almost unbearable all night. So hot did not go to church. Still hot but cloudy in morning. Did a two week's washing. Had a hard storm at 4:00. Terrific wind which done much damage north of here - also very hard thunder and lightning. Quite a lot of rain fell which will save things for a few days. As hot as ever in spite of the shower. Did by ironing. Mr. and Mrs. Roemelt called in the evening. Spent part of the night in the hammock - could not stand the heat in the house. Had our first sweet corn! S??? ?al and poor on account of dry weather. Still hot - a little breeze at night so could sleep better. Helen and I worked about all day getting things ready for the Pomona Grange booth at the Fair of which I am to have charge. Made several posters. Went on hill in p.m. and got three little pine trees for the booth. Still fussing with posters. Went up the road and got pine branches. The boys up to get vegetables for the Veteran booth. Went up to see Amel’s garden on hill in evening. Got some flowers for the booth. Helen took me and my load of material to the Fair Grounds – she went on to Elmira. Edie and Van Duzer helped me put up the booth. Went up to Rozars Grill for dinner with four of the Seeley Creek women. Had a very nice dinner for 60 cents. Back to our jobs after dinner. Helen came back and we looked around the grounds a little before going home – Children barred from grounds on account of polio epidemic. Newspaper Clipping: Stanley Richard Dann, 42, Middle Rd., Town of Horseheads. Tuesday morning, Aug. 22, 1944. Survived by wife; son, James R.; daughters, Joyce M. and Barbara J., all at home; parents Mr. and Mrs. Fred Dann of Horseheads; sisters, Mrs. Irving Chatterton of Towanda, Mrs. C. Arthur Bullock of Canton; brothers, Lawrence, Donald and Gerald of Town of Veteran, Robert of Painted Post. The body will be taken from the Shields Funeral Home to the home for services Thursday, 2:30 p.m. Rev. Harry E. Malick. Vary Cemetery, Town of Veteran. The death of Stanley Dann, aged 42 years, a prominent farmer of the Ridge Road, Town of Veteran, occurred Tuesday morning, August 22, 1944 at the family home. Mr. Dann attended Horseheads High School and Cornell University. He was a life member of Veteran Grange, a Past Master of it, and a member of Pomona Grange. He served as road commissioner of the Town of Veteran for four years and it was during that time that he received an accident which resulted in his being an invalid for nine years. During his active life Mr. Dann was one of the foremost Holstein breeders of the county. He was also 4-H assistant under the late Rufus Stanley. During his association with the 4-H Club he was many times a county, state and national winner. Mr. Dann is survived by his wife; son, James R., and daughters Joyce M. and Barbara J., all at home; his parents, Mr. and Mrs. Fred Dann of Broad Street, Horseheads; sisters, Mrs. Irving Chatterton of Towanda, Mrs. C. Arthur Bullock of Canton; brothers, Lawrence, Donald and Gerald of the Town of Veteran, and Robert of Painted Post. The body was removed from the Shields funeral home to the family home, were services will be held this afternoon at 2:30, the Rev. Harry E. Malick officiating. Burial will be in the Vary Cemetery, Town of Veteran. Canned my first corn – 7 pts. Helen took me down to Phoebe’s to call – took them a dish of salad. Mr. and Mr. F. O. Dann and Dorothy there. Fred a feeble silly old man – is not able to attend the funeral. Quite a lot cooler. Charlie, Harry and I attended Stanley Dann’s funeral. A large funeral and many beautiful flowers. He had been helpless for several years and was a great care. Died from kidney infection and suffered badly at the end. Phoebe going as "chipper" as ever. Helen and I went to Horseheads in a.m. for groceries and to pay bills – electric and telephone. Charlie and Johnson worked at the town clerk’s office. I sent Mrs. Kinney a basket of vegetables. Helen and Walter went to the Fair Grounds and got the material from my Pomona booth. I went to Sunday School and church. Mr. Spencer from Breesport preached and his wife sang – a very good sermon. Helen and I canned corn all day – did 49 pints. Newspaper Clipping: Mrs. Margaret Hurley of Ridge Rd., Horseheads. Wednesday, Aug. 30, 1944, at 3:15 a.m. Survived by husband, William H. Hurley; sister, Mrs. William Japes of Detroit, Mich. Body will be removed from the Charles F. Hughes and Son Funeral Home to the home of Mrs. Timothy Hurley, 1006 College Ave., Thursday. Services there Saturday, 8:15 a.m., 9 at St. Patrick’s Church. SS. Peter and Paul’s Cemetery. Had a stroke early Tuesday becoming unconscious at once – was taken to the hospital but never regained consciousness. Moss Sunday School class met at Moss’ up on the hill. Helen and I attended – Had a nice supper. Those present were: Mr. Cramer, Mr. and Mrs. Wesley Jones, Mr. and Mrs. Coats, Mr. and Mrs. Cherry, Mr. and Mrs. Douglas, Mr. and Mrs. Moss, Florence Hopkins, Edna Bowers, Anna Woodward, Sara Murphy, Clara Kyle, Mona VanWhy, Laura Christian, Katharine Kemmich, Mr. McQueen, Mrs. Wheaton, Helen Samson, Berneice MacDougall. Mr. Cramer talked on Lutheran Church. A nice evening. Got home about 11:00. Got up early to go to Maggie Hurley’s funeral. Went to the house on College Ave. for the little ceremony and to see her – then over to St. Patrick’s church for the funeral. Ruth Mosher, Phoebe Dann, and Ola Chappell went with us. Hurried home to get dinner. Charlie and I went to Dairymen’s meeting in p.m. – Helen went down with us. Had a small attendance and nothing of importance. Jay here for a call. Everything is mixed up – could not go to church. Rained a little in the morning. Canned plums, peaches and pears. Went down to Billings on a F.S.A. errand. They in hard shape with no man. Got the report in the mail. My first fall work – got three other trips to make. Started about 10:00 for the Lake country to get peaches – drove on beyond Hector and looked over the situation – finally got two tree run bushels for 2.25 and one of large peaches for $3.00. Stopped in Watkins Glen and got the boys each new shoes – our birthday presents to them. Sick with a bowel trouble all day. Hated to miss going to the memorial service for Artman Douglass. Home Bureau at the Hall. Helen took me down. I led a Civics discussion. Only seven present. Seemed good to see the women again. Helen took me on F.S.A. work. Investigated Jack Scott below Wellsburg. Also called at Carpenters and Blys. Had a swell ride. Stopped and got Aunt Lou and brought her up for a visit. Started copying the big assessor’s book. The electric co. connected the little house with the current so for the first time in its long life it shone with electricity. Ted getting it nicely fixed up. Charlie came down with a hard cold in the night. Nice and warm. Canned all day – peaches, plums and pears. The men put some corn in the silo but Charlie felt so badly they had to stop. Samsons went to Cortland. Aunt Lou and I visited all day – I also copied a lot in the assessor book. Developed the "epizdoodick" from Charlie – sicker than a fool all day. A very warm day. Helen, Gordon, Aunt Lou and I went on a F.S.A. trip to Seymours and around the city. A swell ride – Helen developing the cold. Had a thunderstorm in the evening. Aunt Lou enjoyed the trip very much. Ate our dinner at a restaurant and "did the stores" in the afternoon. Helen went to a H.B. school on painting. I did a big washing. A cool wind all day. The death of William S. Hamilton, occurred Saturday afternoon, Sept. 23, at his home on the Middle Road, Town of Veteran, after a long illness. Mr. Hamilton had conducted a chicken and bee farming business there for twenty-two years. He is survived by his wife, Nellie Williams Hamilton; a daughter, Mrs. Bruce Warn, at home, and one grandson, Bruce Warn Jr. The body was removed to the Shields funeral home on Mill Street. The funeral services were held at the family home Tuesday at 2:30 p.m., Rev. Earl Robertson officiating. Burial was in Maple Grove Cemetery. Not feeling at all well. Did odd jobs and finished my ironing before dark. So glad Aunt Lou didn’t catch the cold. Ted and the boys having just a slight attack. Had our first frost – froze quite hard in some places. Much warmer. Helen, Aunt Lou and I went over to Ed Stowe’s – found them busy as a nice chicken dinner. They both very good. Had a very nice visit. Gordon’s first day of school – everything o.k. and he as happy as a lark. Helen, Aunt Lou and I went out to Uncle Will’s after an early dinner. Found them well and Aunt Ida crocheting as fast as possible filling orders for Christmas. Had a nice visit and started for home quite early. Got some grapes on the way home – also some groceries in Odessa. Aunt Lou seemed to enjoy the trip very much. Had a hard thunder storm in evening. More warm weather. Helen had to go to H-B for a lesson on painting and Aunt Lou decided she had better go home which she did. Home Bureau Rally. Helen, the boys and I attended. Had a nice supper and a big crowd. Every one brought two articles and here were sold for entertainment – and profit – 27.50 was taken in. I took jar of pickles $.35 and a big calla begonia $1.50. Everything sold for a big price. Had a nice time – seemed good to see everybody after the summer vacation. The Middle Road unit were invited and many attended. Sub. District meeting at the library. Charlie and I attended. Had to go before noon to do business at Oil Co. Had dinner at the New England Kitchen $.95 per place. I spent the time before meeting browsing in the library – also had a visit with Miss Beckwith. Not a very big attendance at the meeting – visited with Mrs. Kahler, Mary Ennis and Myrna. Found Roy Ennis and Rose Marie here when we got home – they stayed for supper. Dr. Elliot T. Bush, 64, 407 Euclid Ave. Thursday, Oct. 12, 1944, at 7 a.m. Survived by wife; Maude V.; daughter, Mrs. Fred E. Potter Jr. of Elmira; sons, Lt. Robert P. in New Guinea, Lt. (j.g.) Elliot T. Jr. in the Southwest Pacific, Aviation Cadet Stuart W. Bush, San Marcos, Tex. ; sisters, Mrs. George W. McGraw of Newtown, Conn., Mrs. Henry L. Emmons of Spencer and Miss Laretta Bush of Horseheads; brothers, Rho of Mt. Vernon, Walter of Elmira, and Atty. Henry Bush of Horseheads; three grandchildren. Body will remain in the Smith & Fudge Funeral Home until Saturday morning. Private funeral Saturday at 4 p.m. at the home. Rev. W. Hamilton Benham. Woodlawn Cemetery. Please omit flowers. Dr. Elliot T. Bush, one of Elmira’s leading physicians and surgeons for 28 years, died of a heart ailment at 7 a.m. today at the Arnot-Ogden Hospital. He was 64. Dr. Bush had a heart attack early last Thursday morning at his home, entered the hospital a few hours later, and was placed in an oxygen tent. He retained consciousness until Wednesday, however, and, despite his own serious condition, insisted that his nurses keep him informed as to the welfare of his patients. Fellow physicians and friends attributed Dr. Bush’s illness to his stern devotion to professional duty and to overwork. A specialist in kidney diseases and other urological ailments, he was in continual and great demand for the most difficult operations. He disregarded his own physical welfare to care for a huge practice, sacrificing rest and regular meals. After a long day in the operating room, in his office, and making house calls, he would frequently make the rounds of his hospital patients at midnight or later. His day began early in the morning. Dr. Bush’s work was truly his hobby as well. He had few vacations and when he did take time from his practice, he spent it at clinics in metropolitan hospitals, or at medical meetings. On a trip abroad in 1931 he devoted a large share of his time to study and observation in European medical centers. He had practiced in Elmira since 1916, and in recent years had his offices at 408 W. Church St. He resided at 407 Euclid Ave. Dr. Bush’s three sons are in the armed forces. Lt. Robert P. Bush of the Army is in New Guinea, Lt. (jg) Elliot T. Bush Jr. of the Navy is a physician on a hospital ship in the Southwest Pacific, and Aviation Cadet Stuart W. Bush is training at San Marcos, Tex. The latter was called home because of his father’s illness. Elliot Bush was born in Horseheads June 16, 1880, the son of Dr. Robert Porter Bush and Loretta Bush. His father was one of the pioneer physicians of Horseheads, practicing there from 1874 until his death in 1923. Elliot attended the public schools in Horseheads and Cook Academy in Montour Falls, afterward devoting a year to teaching. He then entered Buffalo Medical College, where he received his degree in 1903, and interned for a year in the Erie County Hospital. Returning to Horseheads, he formed a partnership with his father, with whom he was associated until 1916, when he opened an office in Elmira. Dr. Bush built up a large practice as a specialist in urological diagnosis and surgery, and served on the staffs of the Arnot-Ogden and S. Joseph’s hospitals. He was a member and former president of the Chemung County Medical Society, a member of the New York State Medical Society and of the American Medical Association, and a fellow of the American College of Surgeons. Dr. Bush also was a member of Horseheads Masonic Lodge 364, of the Horseheads Chapter 261, Royal Arch Masons; of the City Club, and of the Elmira Golf and Country Club. In 1906 Dr. Bush married the former Maude Mattison of Winsted, Conn., who survives. They became parents of three sons and one daughter. Helen, the boys and I went to S.S. and church – It was rally day and Walter received a nice new Bible as he went to a higher class. Seemed good to be able to all go again. Helen took me to Elmira to attend a F.S.A. committee meeting. Just Mr. Kahler and I present – did quite a lot of business. Purchased gift (birthday) for my "Mystery Sister" – hose and handky. Mr. and Mrs. Jones, Mr. and Mrs. Cherry, Mr. and Mrs. MacDougall, Mr. and Mrs. Cramer, relatives of Cramers, Miss Westlake, Miss Kimmich, Mrs. Bowers, Mrs. Hopkins, Mrs. Woodard, Mrs. Moss, relative of Cramer’s, Mrs. Murphy, Mrs. Christian, Mrs. VanWhy, Mrs. Smith. Had a swell supper. Talk on "Church of Rome" by Cramer. Helen and I attended a sale at Gabriels in Odessa in p.m. Bought an aluminum roaster and several pie tins. A bad storm started most of for home and we drove right into the center of it just above Catharine – the worst I ever was out in – sat in the car for a while. Terrible chain lightning all around. Missed the best part of the sale. Boys both woke up with bad colds so we did not go to church. Home all day. Ted worked on his water system at the Parsonage. Ken Farnsworth here in the afternoon. Charlie took the town books over for Johnson to inspect then I had to visit Mrs. Cook on North Chemung road. Picked up an old man in Breesport who wanted to go Horseheads so went around by Bowman Hill. Got some groceries at Grand Union and then went to Luca’s for machinery repairs – home at 11:00. A dark chilly day. [Photo inserted here] Taken in the late summer after her awful siege with angina pectoris. Helen broadcasted for the Home Bureau. I waited in the car and then we went shopping. Got birthday and baby shower presents. Rested in the p.m. Went over to Marian’s for a stork shower for Helen and Florence Turner. Sixteen ladies present. Both girls received many lovely gifts. Played bingo presenting the prizes to the honor guests. Didn’t get home until 12:00. Men finished digging potatoes – had 60 bu. Of very nice potatoes. I attended Home Bureau at the hall. It was a combination meeting with Middle Road unit. Mrs. Gurkee of the Valley Road gave the lesson. Twenty members of our unit present and ten of Middle Roaders. Had a nice dinner. Ruth M. brought me home. Gordon’s birthday supper at 6:00. Guests were: James Saunders, Phillip Dann, Frank Dann, David Conklin, Walter Samson. Menu was: Hot dogs and rolls, creamed potatoes, cabbage, grape and apple salad, ice cream and cake and candy. The party was short on account of approaching darkness. Meeting of Veteran Grange. Had a picnic supper before the meeting. The boys and I rode down with the G. Dann’s. Draped the charter for Ollie, Stanley D. and Mrs. Hurley – a sad occasion. Had a jolly little program on nuts. Voted to hold the annual chicken pie on Nov. 2. Ruth Mosher, Elizabeth Conklin and Mrs. Ford committee. Home at 12:15. Pomona Grange held at Veteran. Had election etc. in p.m. Harry Stowe Master. Had supper at 8:00 – Ruth M. and I made meatballs and vegetable casserole for the crowd. Had a larger crowd in the evening. Delegates elected for State Grange – Deputy recommended (Mrs. Hamilton). C.C.N.G.A. Met at Seeley Creek Grange Hall – I went with Edward and Annabell Van Duzer. Had a lovely trip – a warm and bright evening. Quite a good crowd there. Had a nice supper and many pleasant chats with Granger friends from other parts of the county. Received two new members – Van Houtens – who recently moved from Alleghany Co. to five miles from Elmira on Lowman road. Home at 12:30. Mrs. Florence M. Personius, 80, of Millport. Monday, Oct. 16, 1944. Survived by daughters, Mrs. Maude Crouch, at home, Mrs. M.D. Coykendall of Reading Center, Mrs. T. V. Ostrander of Elmira; son, Ray M. Personius of Montour Falls; five granddaughters, several nieces and nephews. The body is at Van Buskirk Funeral Home, Horseheads, and will be taken to the home Tuesday evening. Funeral at 2:30 p.m. Thursday. Maple Grove Cemetery, Horseheads. Rev. Mary Rines of Harrison Valley, Pa., assisted by Rev. Earl Robertson of Horseheads. Newspaper Clipping: Harry A. Warren, 56, of the Wynkoop Creek Rd., Tuesday, Oct. 17, 1944. Survived by wife, Mrs. Kathryn Bennett Warren; sons, Harry A. Warren Jr. and Carlton; mother, Mrs. Lucy B. Warren; sisters, Mrs. Gertrude Wheaton and Miss Clara Warren, all of Chemung; brother, Nelson, Syracuse; and two grandchildren. He was a member of the Chemung Baptist Church, a past Master of Chemung Valley Lodge, 350, F&AM, and a Masonic past district deputy. A Masonic service will be conducted Thursday at 8 p.m. at the Page Funeral Home, Wellsburg, and the body will be removed to the home of his mother Friday where a prayer service will be held at 1:30, followed by services at the Baptist Church at 2. Rev. John Roney. Chemung Cemetery. A beautiful day – as warm as summer. Finished by ironing. Ed and Florence Stowe over in the afternoon. Martha Saunders here for war chest contribution – gave $10. Home Bureau at Fords. Helen and I attended a good attendance. Helen gave lesson on painting. I had to make brown bread for the dinner. Had a swell meal. Mrs. Roemelt and Mrs. Wheeler committee. Sale at Breesport. Helen and I went quite early. It was in a big garage across from Masonic Hall. A collection of old junk sold by Mrs. Hatch (Grace Moss’ daughter). Helen bought a heating stove, two upholstered chairs and an old bureau. I got a caster and a few dishes. Real cold – M. E. Church served sandwiches and coffee. Saw many I knew. Mrs. Roemelt bo’t an old side board. The men went to Breesport to get our purchases – also brought over the Roemelt’s. Sale at Horseheads. Household goods of Mr. and Mrs. Hicks (she was Jennie Carrier of Pine Valley). Everything went very high. Helen wanted the washing machine – a small sized Kenmore and was sold for $100. Came home early!! Chicken Pie Supper. Helen worked in the afternoon and I went at 5:00 to have charge of the pantry. Had Emma Billings, Lena Banks and Frances Dann for helpers. Had an enormous crowd but food enough. They baked the biscuit at Benjamin’s. Watched the dance for a while. Harry was down for supper – also Walter and he brought us home. Very tired and foot weary. Profited over $350. Children’s Theatre. Helen took Marian, her boys and Gordon and I to the first event of this series – Peter Pan – a very fine production. 1500 children present. Helen went shopping and Walter attended the Kiwanis Day for the 4-H. Had a swell time – got me a new stone blue chesterfield coat at Penny’s. Election. Charlie, Harry and I went to vote in the forenoon. A nice real warm day. Stopped at George Weed’s store and got a few groceries – including six big bananas. Samsons Moved. A nice day. Ted came home at noon and moved their bedroom furniture, got the boys’ bed arranged etc. They all stayed down for the night. Seemed very lonesome around our old shack. The Glad News on the air: Roosevelt won – carrying all but a few states. Such a relief!!! Home Bureau at Banks. Charlie took me down in the morning. A big crowd there. Had a fine dinner Mrs. Horton committee. I gave a lesson on Civics. Helen came for me at night and we went to H-H and got the boys and she took Gordon to Dr. Riley. He didn’t find any trouble with his ears – only lack of enough food and milk. Walter rode home with Ted. Gordon came up with his pajamas saying he was going to sleep "up here" – which he did. Trip to Elsie Cooks. Charlie took me over – her buildings all destroyed by fire and she living "around" so could not find her. Her cow boarding on neighbors who want to get rid of it. Had a visit with Mrs. Burlew also her daughter Mrs. Elston. Pomona Dance Contest. Charlie took Walter and I. Had a nice picnic supper and a peppy contest. A cold fog in the morning. Did a big washing and the clothes froze for a few minutes. Sun soon shone out and it was like summer the rest of the day. Helen and I went to town – tried to find Elsie Cook in H-H. – no result. Got a combination stool and stepladder and an ironing board. A nasty rainy day. Helen up to wash and stayed to dinner. Had chicken pie. Lily down and spent the afternoon. Seems good to have her in the neighborhood again after working 19 months at the Point. Rained all night. Went to Horseheads and over to Elsie’s – found her this time. Nice and warm. I went over to Odessa with Marian. Fritzie, Freddy and I all had their hair cut. Did some shopping for Sun. dinner. Jack Deal radio entertainer gave a performance at the Grange Hall. A large crowd – a very common place entertainment mostly piano playing of popular songs. The Samson family all attended. I went with them. The young folks danced after the big (?) show. He received $15 for his playing. Newspaper Clipping: Born at St. Joseph’s Hospital, a son Saturday, Nov. 18, 1944 to Edward and Ellen Chapman Osborn of Horseheads. Had beefsteak for dinner 40 cents per lb. Began snowing about daylight and continued all day and night – some of it melted but ground was well covered. Dried the washing over the register so could do the ironing in the p.m. Boys got their sleds out and did a little coasting after school – the first of the season. Still snowing – snowed and thawed all day. Ground covered with about 3 in. Dressed a duck and a 6# young Hampshire red rooster to take to the Fishels. A dark stormy disagreeable day. Helen up in the afternoon. Received a letter from Aunt Ida from the Penn Yan hospital where she recently had a cancer removed from her breast with a promised 60% chance of getting over it. [2 photos inserted here] Edith Day and her son who is in training. [Dora, Mary ] Day now married. A nice warm day. Helen, Charlie, the boys and I started for Bingo at 8:30. Had a very good trip – no snow on the road after leaving the "upper Ridge" – found some fog along the river. Reached there about 11:15. Everyone glad to see us. Had dinner at 12:30 crowning glory of which was a big turkey. Had a nice time after dinner talking over Christmas etc. – got a few suggestions for gifts. Left at 4:00 – another nice trip. Gordon slept most the way. He stayed all night with us. Went to bed at 6:45 and woke up Fri. 10:45. Everybody tired – but happy. Rested most of the day. The boys and I attended Grange in evening. Developed a jumping toothache so did not enjoy the meeting very well. Had third and fourth degree – candidates Joyce Dann, Mr. and Mrs. Dean Baylor. Had sandwiches, doughnuts and coffee at the close of the meeting. Helen came for us. Suffered all night with toothache. Sub. Dist. Meeting in Elmira. Helen and the boys went with us. We all went over to Sears after the meeting. I got some material to make Christmas gifts. Toothache all day and all night. Found some peppermint at Lovell’s drugstore also some different toothache drops. Home all day as usual. A dark day. Helen came up and washed. I cleaned paint on kitchen ceiling. Herb Chapman and Harry killed Herb’s pig and one of our hogs. Helen got a phone call that a dealer in Heights had a washing machine for her so she and I went down after dinner and she bought it – a "Speed Queen" like ours $60. For times of want and loneliness and need. Thy plans are followed and Thy glories wrought. We’ll face courageously another year. Our praise and thanks forever flow! Communication and transportation services were disrupted in Chemung County Thursday by an 18-hour snowstorm which brought automobile traffic to a virtual standstill in many sections of the Southern Tier. Drifts six to eight feet deep blocked county highways in isolated sections of the county and city pavements were treacherous early today after a late freeze transformed the streets into icy ribbons. Only one minor accident was reported in the city as a result of the storm. It was estimated that at least 4 ½ inches of snow fell in the city from 9 p.m. Wednesday to ??? p.m. Thursday at the temperature dropped steadily to a low of 26 at 11 p.m. Telephone, telegraph and power service was interrupted at frequent intervals and at various sections of the county as trees were felled by high winds and heavy snow snapped power and phone lines. It was reported that 40 lies, serving 150 telephone users, were broken during the storm but all service had been restored early today. In addition, 40 long distance telephone lines, feeding Elmira, were out of order for several hours yesterday but efforts of linemen resulted in almost complete resumption of service this morning. Western Union lines to New York were out of commission for several hours Thursday and messages were sent to Buffalo for relaying to New York. However about 10 p.m. Thursday it was reported the full service was restored. Power line trouble kept a full staff of utility company workmen busy from early morning until late hours Thursday. Homes in the North Chemung, Breesport, Wellsburg and South Creek Rd. vicinities were affected by power line failure caused by trees falling and the burden of snow on the lines. Albany (AP) – Three deaths were attributed to the season’s worst snow, rain and wind storm which swept New York State Thursday from Buffalo to the Battery. The weather bureau prediction for today was more of the same – with lower temperatures. Motor traffic was bogged by snow which measured a record 15 inches at Syracuse by midafternoon. Air travel was at a virtual standstill and rail movement was delayed. Newspaper Clipping: "Close to two feet" of snow was predicted by today at Syracuse, where the heaviest previous 24-hour fall on record for November was seven inches in 1927. Three-foot drifts were reported in the Pulaski-Sandy Creek area. Cortland reported nearly a foot of snow up to noon. Wires and branches snapped and automobiles stalled on drifted highways. High tides on Long Island interrupted railroad service and flooded cellars. At Rye, children were removed from the Milton Public School in rowboats manned by police when tidewaters flooded the basement. Part of the business section of the village of Port Chester, near Rye, was flooded. A northwest gale of more than 40 miles an hour accompanied by snow and rain was sweeping toward New York City. Two inches of snow fell at Buffalo, where a low of 18 degrees was predicted overnight. Rochester reported four inches of heavy, wet snow and a hard wind. The expected low Thursday night was 20 degrees. Nearly an inch of snow had fallen at Albany my midafternoon. A low of 25 degrees was predicted before morning. Everyone stuck in the snow on way home from work. Ted left his car at Geo Turner’s and walked in. More snow and banks on the Ridge than it has seen in years. Miss Wanda L. Stanton, daughter of Mr. and Mrs. Glycon Stanton of Big Flats became the bride of Francis E. Courtright, son of Mrs. Mary Courtright and the late Emmett Courtright of the Middle Road, on Saturday, Dec. 2, at 2 p.m. at the home of the bride’s parents in Big Flats. The double ring ceremony was performed by the Rev. Lauren B. Kinter, pastor of the Calvary Baptist Church at Gibson, before an improvised altar decorated with palms, pompoms and lighted candles. The couple was attended by Miss Belva Stanton, the bride’s sister, and the bridegroom’s brother, Stephen Courtright. The bride, who was given in marriage by her father, wore a full length fuchsia velvet gown with a tiara of white roses and carried a white Bible having a corsage of white roses attached to it with white taffeta ribbons. She also wore a single strand of pearls. Miss Belva Stanton wore a full length blue velvet gown with a corsage of talisman roses. The bride’s mother wore a street length green crepe dress with a corsage of yellow roses and tiny pompoms, and Mrs. Courtright was gowned in a blue crepe street length dress with a corsage of white roses and pompoms. A small reception for the newlyweds was held at the home. Mrs. Courtright, a graduate of the Corning Northside High School, has been secretary for Ernest C. Grant at the 4-H Club Office for the past three years and she and her husband, a graduate of Horseheads High School, has been prominent members of the 4-H club for eleven years. Newspaper Clipping: Mrs. Flora G. Mowry, 79, of Watkins Glen. Tuesday, Dec. 5, 1944. Survived by son, Earl of Watkins Glen; brothers, John Goodwin of Reading Center, William Goodwin of Pasadena, Calif.; sister, Mrs. Emmett Rhynehart of Montour Falls; several grandchildren. The body is at the Haughey Funeral Home, Watkins Glen, where the funeral will be held Friday, 2 p.m. Rev. Harry A. Sager. Millport Cemetery. The plows have the roads well cleaned off and thawy weather helped. Helen and I went to city in the morning. Shopped until noon. I had to attend F.S.A. committee meeting in the p.m. Only Mr. Tuttle and I present. Rained a little toward night. Helen and I went to city very early to do Xmas shopping – such a job to find anything reasonable in price and quality. Got home quite early. A bad snow storm again – celebrated by washing. The boys brought me a swell birthday cake and both of them stayed to dinner. No school on account of storm. Newspaper Clipping: Persons whose birthdate it is have the augury of a year of realized ambitions and broader experience. New friends and changed environments are indicated. Parts of cards received on my birthday. From cousin Lulu who was stricken with another angina attack the night after sending the card. From Martha Saunders enclosing a handky. [Cut outs from greeting cards inserted here] From Marian. From Emma Randolph Billings – our friendship started in 1894 at Dist. No. 2 Veteran school. Roads drifted - full milk truck did not start until 2:00 – after snow plows had been thro’. [Cut outs from greeting cards inserted here] From your Secret Pal. From Grace. Went to Elmira to attend Lesson I of "Family Life – When the Boys Return." So many talkers that Dr. Kuhn didn’t have much of a chance to instruct. Helen did Harry’s shopping – we finished up in Horseheads. The road a tunnel most of the way – the first deep snow in two past winters. Streets in city had walls of snow thro’ center of all the streets and trucks busy trying to get it removed. Helen and I left for Elmira at 8:15. Found Grace in the depot. We all shopped around all the a.m. Had dinner at the Empire then drove down and took Aunt Lou’s Xmas box. She well but freezing the old house was so cold. Quite a cold day. I went to F.S.A. committee in p.m. Everyone present. Got home in good season. Seemed good to have Grace here. Roads some slippery near home – snow piled along roadsides most of the way to H-H. Visited and cooked for Xmas. Grace and I made fried cakes all forenoon. Visited in p.m. Dressed two ducks and a 9# red rooster. I made pies and roasted part of a ham. Charlie and I went to Sub. Dist. meeting in p.m. Grace kept house. We met Virgil and Marian on the 4:00 train which came at 5:00. Did some shopping in H-H.
Mr. and Mrs. Claude N. Brown, 681 McDowell Pl., announce the marriage of the former’s daughter, Dorotha, to Joseph Miller, son of Mr. and Mrs. Thomas Miller of Corning, which took place Dec. 23, 1944. Mr. and Mrs. Edward Kowalski of Horseheads were attendants. Mr. and Mrs. Miller are living at 121 Roosevelt Ave., Horseheads. Fussed for the Xmas dinner all forenoon – had lunch at noon. Satie and Will up and spent the p.m. Had our Xmas dinner at 7:00 – waited for Harry – had the tree in evening – everyone received many nice gifts. I especially well remembered. Late to bed – tired and happy. Quite cold and roads some slippery. Had lunch at 11:00 and Ted took the folks to the noon train. Train very, very crowded. I went down with the boys to see their Cortland gifts which they received by mail and had not yet opened – many nice things. Snowed and blew from the south all afternoon. George Rundle, 75, a lifelong resident of the Ridge Road, died Wednesday, Dec. 27, 1944 at his home. He is survived by his widow; a daughter, Mrs. Clara Kyle, a granddaughter, Mrs. Ira Hirsh of Urbana, Ill., and five nephews. Mr. Rundle served as Supervisor of the Town of Veteran from 1916 to 1922, was a charter member of the Veteran Grange and a member of the Horseheads Baptist Church. Mr. and Mrs. Rundle would have celebrated their 54th wedding anniversary on Jan. 7. Funeral services were held Saturday afternoon at the Gustin funeral home, the Rev. Harry E. Malick. Burial was in Maple Grove Cemetery. Mrs. Mary A. Williamson, 79, died at the home of her son, Ward L. Williamson, 917 Westlake Street, Friday, Dec. 29, 1944, after a long illness. She is survived by her son and a daughter, Mrs. Maude Van Nordstrand of Horseheads; sisters, Mrs. J. J. MacBride and Miss Jane Rader of Elmira; brothers, J. B. Rader and William Rader of Elmria, Edward of Pittsburgh, Pa., and Charles of Indianapolis, Ind. ; ten grandchildren and fourteen great grandchildren. 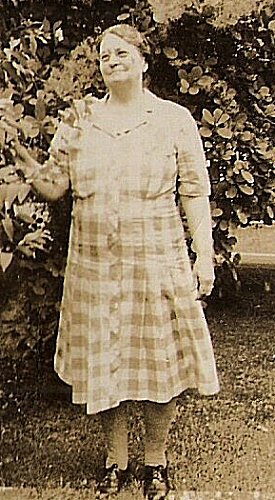 Mrs. Williamson was a member of the First Baptist Church and of the Friendly Bible Class of that church, having been in the past very active in church affairs. She also was a member of Horseheads Chapter, OES. Funeral services were held at the family home Monday at 2 p.m., the Rev. Richard W. Cramer officiating. Burial was in Maple Grove Cemetery. An awful day – wind blew a gale and snow filled all the roads. Ted decided it was not safe for Helen so they went to Elmira and got a room. Snow plow thro’ at night but it blew in again. Wind abated in the night. Announcement is made of the marriage of Miss Betty Jean Templar, daughter of Mr. and Mrs. Sanford Templar, 829 Johnson St., to Ralph Dann, son of Laurence Dann of Horseheads. The Rev. Herbert J. Gordon performed the ceremony Dec. 29, 1944, at 9 p.m. at his home, 584 Maple Ave. Mrs. Ernest Palmer, sister of the bride, and Marshall Conklin were the attendants. After a supper at the Homestead Tavern, the couple left for a short wedding trip. They will make their home near Horseheads. The Veteran Home Bureau held its annual Christmas party at the home of Mrs. Charles Mosher. Mrs. Edward Van Duzer presented the program and Mrs. Alan Carrier the recreation. Mrs. Donald Dann and Mrs. Clifford Hayes served the refreshments. Christmas gifts were exchanged and mystery sisters names were drawn for the coming years. Present were: Mesdames Frank Conklin, Amel Ramstein, Charles MacDougall, Anson Saunders, Charles Wheeler, Glen Stevens, Milton Roy, William-Tuma, John VanWhy, Roy Chappell, Edward Stermer, Henry Walther, George Horton and Earl Miller. Home Bureau Xmas Party. The snow rotary plow and flower thro’ some wonderful machine blew the snow over the top of our farm. Went to party in evening with Lily and Amel. Had a good crowd and a wonderful evening. I got a nice Daily Reminder for a gift. Had fruit salad, crackers and tea for refreshments. Roads quite good but snow deep. Charlie and I went to George Rundle’s funeral – at Gustin’s. Took eggs to the grocery. Ruth Stowe rode up home with us. Ted and Helen home for the day – he did the family wash – weather looked bad to they went back to their city room at night. Wash the cauliflower, and cut into small flowerlets. Wash and seed the green peppers, cut in halves, then into ¼ slices. Pour boiling water over the onions; let stand 5 minutes, then skin. Wash and cut the tomatoes in slices. Mix the cauliflower, green peppers, onions, tomatoes, whole small cucumbers, and cucumber slices in a large bowl. Cover with a brine made by combining the salt and 4 cups of the water. Let stand 3 hours, then bring just to a boil in the same water. Drain. Meanwhile heat the vinegar, sugar and celery seed to the boiling point. Mix the flour, mustard and turmeric to a paste with the remaining 2 cups of water, then add to the hot vinegar mixture while stirring constantly. Add to the drained vegetables and cook 20 minutes, stirring occasionally. Turn into hot sterilized jars and seal. Yield: 7 pints. Chop and mix peppers and onions. Cover with boiling water and let stand 5 minutes. Drain. Add vinegar, sugar and salt and boil 5 minutes. Put into clean jars while hot. Yield: 2 quarts. Combine vegetables with salt, and let stand ½ hour. Drain. Heat vinegar, sugar and spices. Add vegetables and boil for 5 minutes, or until transparent. Pack the pickles into clean hot jars and seal. Yield: 2 quarts. Mix the sugar, water, vinegar and salt. Add spices, tied loosely in cheese cloth. Heat to boiling and boil in a covered saucepan for 5 minutes. Slice cucumbers and mix with onions, green peppers and salt. Mix with ice cubes, cover, and let stand for 3 hours. Drain. Combine the remaining ingredients, add vegetables and heat to boiling. Pack into hot, clear jars and seal. Yield: 2 quarts. We shall miss Mrs. Bigden greatly at the College of Home Economics. She was not only interested in furthering the education of girls for homemaking, but she was always generous in using her abundant energy, her wide knowledge, and sympathetic personality to help all the women of New York State. Her service to them cannot be overestimated. As the first president of the New York State Federation of Home Bureaus, she laid the foundation for the program which has brought the Federation to its present strength. It was Mrs. Brigden who, because of her interest in the education of girls, and her belief in extension work, started a fund to help students of marked ability to get training at the College that would fit them to become home demonstration agents. This fund later became the Carrie Gardner Brigden Scholarship. From that beginning came the five Home Bureau Scholarships granted each year to students in home economics. Mrs. Brigden’s work is not ended but will go on forever as these girls graduate and continue to help families to improve their home making. Mrs. Carrie Gardner Brigden, 91, of Marathon, a pioneer in home bureau work in New York State and the first president of the State Home Bureau Federation, died on November 30. Mrs. Brigden went to London in 1930 to participate in the founding of the only international organization of rural women, the Associated Country Women of the World, and returned to Europe in 1939 for its triennial meeting. The first home bureau scholarship at Cornell, named in her honor, has already been awarded to 20 young women. Many here in Chemung County remember that she spoke at our annual meeting in 1940, in honor of our 20th Anniversary.